GUIDERLAND -- Army National Guard Soldiers have to be ready to go into action both stateside and overseas, and the Soldiers of Headquarters and Headquarters Company of the 42nd Combat Aviation Brigade are now better prepared to do either one. 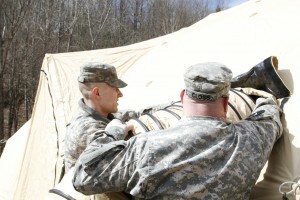 At the Guiderland Range, outside Albany, on Saturday, April 11, two teams of HHC Soldiers each practiced setting up the brigade’s command post tent to rehearse for an exercise the unit will conduct at its annual training at Camp Smith Training Site in July. Known as SICPS, for Standardized Integrated Command Post System, and pronounced “sick-cups”, the Army- standard tent system houses computers, projection screens, maps and everything else required to run a mission. At annual training the company will set up a tactical operations center, or TOC, to support a battle simulation. But the skills needed to do that also apply during a response to a natural disaster at home or deployment to a combat zone, said Master Sgt. Gregory Martin, the brigades’ operations non-commissioned officer in charge. The National Guard used such systems during the response to Sept. 11, Hurricane Irene and Hurricane Sandy, Martin said. “For any type of emergency that we have stateside, we can get these tents up and then get operations in there,” Martin said. Aside from getting ready for a real mission, the master sergeant said the other goal of the training was to prepare Soldiers who hadn’t set up command post before by having them work alongside and learn from comrades who know how to perform the task. Sgt. Ruben Jiminez and Sgt. Timothy White, electronic warfare specialists with headquarters company, were among the 15 to 20 Soldiers who previously received SICPS training and then guided their comrades through the process to help them gain the knowledge. It is hard to cram what that group learned in about four days into a few hours, Jiminez said, but overall, he feels the Soldiers performed well and prepared themselves for their mission. The training provided familiarization for all Soldiers involved, as White said the unit is transitioning to new, standardized tents that easier to set up, maintain, clean and repair. “They basically incorporated these to make it more of a quick setup TOC or a quick setup for a HAZMAT relief or whatever we’re called in for,” he said. While the teams set up their respective SICPS, company commander Capt. Gary Jamieson and 1st Sgt. Phoebe Larned worked with them and also took note of deficiencies in missing or broken equipment so that any issues can be corrected before the unit heads to Camp Smith. One team also had an issue with its generator not starting because of a battery problem, and while it eventually got the machine running, Martin said identifying those deficiencies is another reason to conduct the training ahead of the mission. Jiminez helped his team diagnose and solve the generator issue. While that situation slowed the team’s progress, he said it is better to find those problems during a rehearsal rather than the scenario.